There are several types of plagiarism which range from literal, word-for-word copying to appropriating the ideas or discoveries of others. Following is a list of plagiarism types consolidated from the sources identified below. Word for Word Plagiarism: Copying a source’s text exactly the way it is written. Paraphrasing Plagiarism: Condensing the work of another in your owns words without citing. Copy & Paste Plagiarism: Copying and pasting text from an electronic source and using it as your own. Word Switch Plagiarism: Taking a sentence from a source and only switching around a few words. Style Plagiarism: Replicating the style and format of a source’s writing. Metaphor Plagiarism: Using metaphors or analogies from a source as your own. Idea Plagiarism: Using the creative ideas of another as your own. Self-Plagiarism: Reusing portions of previous writings in subsequent papers, either as a re-titled paper, or a compilation of bits and pieces of previous papers. Publishing Ethics: Quality of Research Literature"
"Intelligent plagiarists are the most dangerous"
The phrases "intelligent plagiarist" and "intelligent plagiarism" are used and explained in the excerpt below, taken from the 2004 Correspondence article in Nature: "Intelligent plagiarists are the most dangerous". Sturla H. Eik-Nes et al. are "intelligent plagiarists" who continue to engage in "intelligent plagiarism" of Dr. David J. R. Hutchon's original idea and method, the Hutchon Method of Population-based Direct EDD Estimation (PDEE), Hutchon 1998. Moreover, the intelligent plagiarism by Sturla H. Eik-Nes et al. is incorporated into Directorate of Health's knowledge-obviated, medically & ethically flawed 2014 Recommendation; a recommendation (i.e., policy) which is proven to cause unnecessary increased medical risks, critical medicals mistakes and grievous medical harms. "What is worse, in my opinion, but was not discussed in these Nature articles, are cases where scientists rewrite previous findings in different words, purposely hiding the sources of their ideas, and then during subsequent years forcefully claim that they have discovered new phenomena. Such 'intelligent plagiarism' is, unfortunately, often more successful because most scientists do not have either time or sufficient interest to carefully investigate where the original results came from. 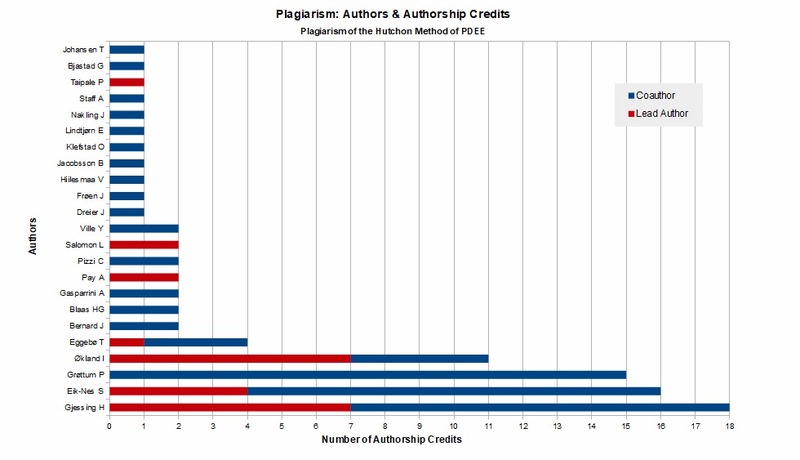 ​Included below is a bar chart of the distribution of 89 authorship credits among 23 authors of 24 publications which plagiarized Dr. Hutchon's original idea and method, the Hutchon Method of Population-based Direct EDD Estimation (PDEE), Hutchon 1998. The International Committee of Medical Journal Editors (ICMJE) recommendations regarding scientific misconduct (i.e., data fabrication, data falsification and plagiarism) are identified in the excerpt below. The World Association of Medical Editors (WAME) issued the following statement regarding research misconduct "including plagiarism, citation manipulation, and data falsification/fabrication, among others." There were 65 coauthor credits (i.e., authorship not credited as lead (or first) author: 89 - 24 = 65); and, with respect to the occurrence and severity of plagiarism and coauthors' responsibilities, included below are 2 excerpts from the 2006 article "Pillory after research fraud – will it help?" ("Gapestokk etter forskningsfusk – vil det hjelpe?") by Harm-Gerd K. Blaas, Kjell Å. Salvesen & Sturla H. Eik-Nes., published in Tidsskr Nor Lægeforen. Interestingly, there was a total of 60 coauthors in the Jon Sudbø case of scientific/research misconduct via falsification and fabrication. "We agree with Magne Nylenna's assessment that it may be unfortunate to exonerate co-authors of fraudulent scientific articles entirely from responsibility (17)." Ironically and sadly, 2 of the 3 authors of the article "Pillory after research fraud – will it help?" ("Gapestokk etter forskningsfusk – vil det hjelpe? "), NCFM members Harm-Gerd K. Blaas and Sturla H. Eik-Nes, were, themselves, author and coauthor victims of plagiarism, respectively, in the ﻿﻿Asim Kurjak case﻿ of plagiarism which was described in BMJ by Iain Chalmers (director of the first Cochrane Centre) in his article: "Role of systematic reviews in detecting plagiarism: case of Asim Kurjak" (BMJ 2006;333:594). Interestingly, Sturla H. Eik-Nes wrote a 01.12.2006 response to Chalmers' article titled: "The case of Asim Kurjak - ISUOG Statement of 2002" in which he stated he was responding as the President of ISUOG (1998-2002). Moreover, it its interesting to note the plagiarist Asim Kurjak was integrally involved within ISUOG, as were the plagiarists Sturla H. Eik-Nes, and Yves Ville. This fact serves to make the point that plagiarism and plagiarists operate at all levels, which includes the highest levels of ISUOG and UOG. The excerpts below were taken from the article" "Report: Scientific misconduct v / Harm-Gerd Blaas" authored by Nasjonalt Senter for Fostermedisin, St Olavs Hospital, Universitetssykehus i Trondheim, which Sturla H. Eik-Nes headed at the time. "There are examples that plagiarism has been revealed in the work of systematic reviews. When the people who have cheated are not subjected to sanctions, it is unlikely that the problem will disappear." "Asim Kurjak was a co-founder and long-term member of the board of ISUOG, and he was still co-editor of the association's journal "Ultrasound in Obstetrics and Gynecology."" "It is therefore useful to protest. The process from which we made our complaint until the complaint was processed was questionable and characterized by lobbying. We became aware that there was no international appeal body for such scientific offenses. ISUOG had no rules for handling such a case. Some ISUOG board members felt that our complaint was not something that ISUOG should proceed with. But there was a clause in the ISUOG's rules that allowed the board to exclude members who in their 'reasonable opinion' were harmful to the association. It was also demanded from some members of the board of ISUOG that the association had to have a robust policy against scientific misconduct that covered accusations of cheating by board members, cheating in presentations at the association's congresses, and falsification and plagiarism in the association's journal. Therefore, ISUOG is now revising its regulations so that scientific misconduct can be treated." "How is it in Norway? Do we have a complaint body in Norway that can be addressed and which can possibly raise the case internationally with similar agencies in other countries? Is gross scientific misconduct a private matter between plagiarism, publishers and the one that was copied? Many would rather not be involved in such affairs. But is scientific misconduct not an issue that we should all be concerned with? The question "... how much more dishonest research will have to be conducted and published before our complacency finally damages the reputation of the medical research community beyond repair?" should we also be in Norway." Again, Harm-Gerd K. Blaas and Sturla H. Eik-Nes were, themselves, author and coauthor victims, respectively, of the Asim Kurjak case of plagiarism. Nevertheless, Blass and Eik-Nes appropriated and plagiarized Dr. David J. R. Hutchon's original idea and method, the Hutchon Method of Population-based Direct EDD Estimation (PDEE), Hutchon 1998. Specifically, the first instance of plagiarism was within NCFM Snurra Group's publication of Eik-Nes et al. 2005: "OC20.01: Predicting remaining time of pregnancy—a new approach to the prediction of day of delivery". However, the first known instance of plagiarism of Dr. Hutchon's original idea and method resulted from a recognized collaboration of NCFM Snurra Group with Pekka Taipale and Vilho Hiilesmaa of Finland. Strangely (or strategically), Sturla H. Eik-Nes did not seek an authorship credit of the paper which resulted from this collaboration: Taipale & Hiilesmaa 2001: "Predicting delivery date by ultrasound and last menstrual period in early gestation". ​Magne Nylenna opened his article "Forskningsfusk i stort og smått" ("Research fraud in large and small") [via reference (17) above] with a clever use of the classic W. C. Fields line from the movie, My Little Chickadee (1940), in which Fields starred alongside Mae West. "If a thing's worth having, it's worth cheating for." Magne Nylenna opened his article "Research misconduct: lessons to be learned?" regarding the Jon Sudbø case of research misconduct via falsification and fabrication. Jon Sudbø was a Norwegian dentist and physician found to have falsified and/or fabricated data for his PhD thesis and most of his research papers. Sigmund Simonsen opened his article "Playing by the rules - Scientific misconduct in a legal perspective" by making the point about individual responsibility and institutional responsibility with respect to the Jon Sudbø case. Anders Ekbom was quite specific about his take on the Jon Sudbø case in his article: "Investigation of scientific misconduct – some personal reflections"
1. It will happen again! 2. It will happen again! 3. It will happen again! 1. You need lawyers, or access to good legal advice. 2. It is a costly and time consuming process. 3. You have to be an outsider. 4. Investigating is different from research." "Perhaps the most important thing is that the naivety is gone. The awareness that the full range of breaches of good research ethics, from cheating to regular fraud, may also occur in Norway, has increased significantly. A wide range of regulations have come into place. In 2007, the Research Ethics Act came into force. Here the regional ethics committees and a national scrutiny committee became statutory. In addition, scientific dishonesty was given a legal definition in the form of "falsification, fabrication, plagiarism and other serious breaches of good scientific practice committed intentionally or grossly negligently in planning, conducting or reporting research" (§5). In 2009, the Health Research Act was implemented with requirements for organizing and approving research projects as well as research director, project manager and research protocol ( 2). Many institutions have also adopted their own research ethics rules. Compulsory courses in the PhD programs with research ethics have been introduced as a central part of the content. Scientific journals have tightened the duty of disclosure for all co-authors. Most journals now require comprehensive declarations of conflicts of interest, fulfillment of authorship criteria and responsibility for different parts of an article." In the wake of the Jon Sudbø case of research misconduct the research administrations at Oslo University Hospital (OUH) in collaboration with Haukeland University Hospital (Bergen) published a research handbook appropriately titled "From Idea to Publication: THE RESEARCH HANDBOOK", 7th EDITION 2017. It is important to refer to high quality studies that provide a balanced account of the background for your research question, preferably reporting the original studies that first described the findings. Studies that confirm such findings may also be mentioned, but not without including the original paper. Reporting thoughts, ideas and statements from others, as if they were your own, is considered plagiarism. Plagiarism is intellectual theft, and is regulated in Norway by "Lov om opphavsrett til åndsverk", https://lovdata.no/dokument/åndsverkloven [Updated URL: https://lovdata.no/dokument/NL/lov/1961-05-12-2] [New Copyright Act: https://lovdata.no/dokument/NL/lov/2018-06-15-40] as well as by "Lov om Universiteter og Høyskoler", https://lovdata.no/dokument/lov om Universiteter og Høyskoler [Updated URL: https://lovdata.no/dokument/NL/lov/2005-04-01-15]. "Correct use of references shows academic integrity and avoids plagiarism. Presentation of results, thoughts, ideas or formulations made by others, as your own, is plagiarism. Plagiarism is intellectual theft, and is regulated by several Norwegian acts, including "åndsverkloven" (https://lovdata.no/dokument/åndverksloven [Updated URL: https://lovdata.no/dokument/NL/lov/1961-05-12-2] and "universitet- og høyskoleloven" (https://lovdata.no/dokument/universitets-og høyskoleloven [Updated URL: https://lovdata.no/dokument/NL/lov/2005-04-01-15] ). See Chapter 9 (on publishing), as well as an article on the use of references in the "Research Ethics Library" (http://etikkom.no/FBIB)." Much has been written on the subject of "unintentional plagiarism," however, the conclusions are always the same; it is still plagiarism. Confusing intentions and efforts with a result that is plagiarism is a mistake; a mistake for which there is a plethora of excuses, because results which are plagiarism have both seen and unforeseen, downstream consequences; consequences which in the field of medical research, can contribute to, and cause increased medical risks, critical medical mistakes and grievous medical harms. LailasCase.com proves this. As articulated above, the stresses of 'publish or perish' career realities can induce aberrant behaviors which result in academic misconduct and research misconduct. Included below is the abstract of "Publication pressure and scientific misconduct in medical scientists" from the Journal of Empirical Research on Human Research Ethics. Included below, in chronological order, are the known publications resulting from the appropriation and plagiarism of Dr. Hutchon's original idea and method, the Hutchon Method of Population-based Direct EDD Estimation (Hutchon, 1998). There are 24 known publications with 88 authorship credits among 23 authors. Note: Funding, Institutions and Acknowledgements are included if available from the publication. Funding: "Supported by grants of Maud Kuistila Foundation, Helsinki, Finnish Cultural Foundation, Helsinki, and Jorvi Hospital Research Foundation, Espoo, Finland." Acknowledgements: "We thank Christine Østerlie for extensive data quality ascertainment and Nancy Lea Eik-Nes for revising the manuscript." Acknowledgements: "L. J. Salomon designed the study, supervised the analysis and wrote most the manuscript. J. P. Bernard co-designed the study and supervised its realization as well as the manuscript. A. Gasparini and C. Pizzi performed the statistical analysis. Y. Ville supervised the study and the manuscript writing. Women gave oral informed consent prior to ultrasound examination (US) in all cases. There was no IRB because this research did not modify routine prenatal care." Acknowledgements: "We would like to thank Nancy Lea Eik-Nes for revising the manuscript." Acknowledgements: "Leif K. Gjessing supplied us with the data files. Nancy Lea Eik-Nes revised the manuscript." Acknowledgements: ""We would like to thank Nancy Lea Eik-Nes for revising the manuscript." Acknowledgements: Hovedveileder: Sturla H. Eik-Nes Biveiledere: Håkon K. Gjessing og Per Grøttum A; Individuals: Torbjørn Eggebø, Nancy Lea Eik-Nes, Kjell Løvslett, Stein Tore Nilsen, Sissel Moe Lichtenberg, Astrid Rygh, Leif K. Gjessing, Anita Steinbakk, Ane Cecilie Munk, Gerd Inger Lånke, Eva Tegnander, Harm-Gerd Blaas, Anne Brantberg, Morten Dreier, Hilde Magnussen, Mara Andrejic & sonographers. Acknowledgements: "We thank Christine Østerlie for extensive data quality ascertainment, Aase Devold Pay for useful discussions and Nancy Lea Eik-Nes for revising the manuscript." Institutions: Senter for fruktbarhet og helse, Folkehelseinstituttet Institutt for global helse og samfunnsmedisin, Universitetet i Bergen.